MADI's Security Services help you reduce physical risk, manage threats and eliminate vulnerabilities which can cause loss, harm and more. Uniforms and Badges Alone Can NOT Protect Your Business! Are there unrecognized physical threats and vulnerabilities putting your business at risk such as shoddy fences, insufficient lighting or camera systems? Is your business unknowingly exposed to theft, fraud, and even sabotage or other possible losses? 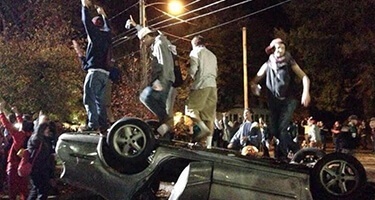 And what if the unthinkable happens such as a natural disaster or civil disturbance? Will you really be safe? Do you really have the protection you need? That’s why MADI's Security Services is staffed by teams of experienced, certified, and professionally trained former federal agents, law enforcement and military personnel, and tenured security officers. Respond to an Imminent Threat. MADI’s trained and experienced security personnel can be deployed to protect your business within hours. Fast Response Protection Teams are Avaialble. Protect your people, property, products and brand. Now you can have 360-degree protection at your site or sites. Our leadership team is made up of experts with decades of experience, and our security teams comprised of former military and police officers who are constantly trained in security best practices to reduce risk. Whether escorting reporters or protecting television stations and satellite trucks in the field; preventing theft, vandalism or sabotage by disgruntled employees; or protecting employees or property from an unruly mob, MADI can deploy urgent response teams to ensure your safety. When a natural disaster hits your area, your facility, products and equipment may be damaged and/or vulnerable to the elements and theft, and you may also be challenged to take extraordinary temporary measures in order to continue to maintain secure and safe operations. The holistic approach to manage physical risk and ensure business continuity. Extra protection for your organization's management teams and families. Services range from on-site protection, to the posting of residence security agents at executives' homes to protect their families, and provide 24/7 security when needed. Protect your people, products and property. Secure and protect your organization from physical threats that could cause serious loss or damage to your property or injury to your people by providing the highest levels of protection that typical security solutions cannot and do not provide. 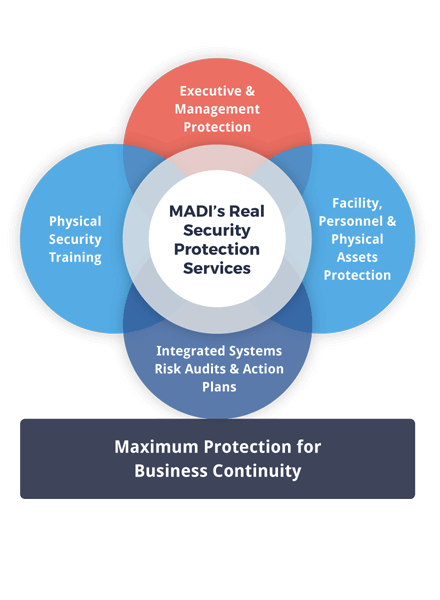 MADI's Business Continuity Action Plan is your guide to maintain operations in the face of a wide range of threats, and addresses security system design, compliance, and specified readiness levels in order to deliver Security Teams to your site or multiple sites in time frames that meet your company's tolerance for risk. Training to empower your personnel to foresee and respond to threats. MADI's senior agents and officers provide customized, on-site training programs that empower your personnel to be safe and in compliance with local, state and federal laws, through proprietary coaching and training programs developed by the MADI leadership team. Tailored security systems to protect new or existing facilities. MADI's inspectors and certified physical site designers help you identify vulnerabilities and build systems for maximum physical protection and return on investment, as well as assessment of normal operations utilizing day and night studies, and security gap analysis of all security systems including fence, IP camera systems, access control and exterior illumination, etc. 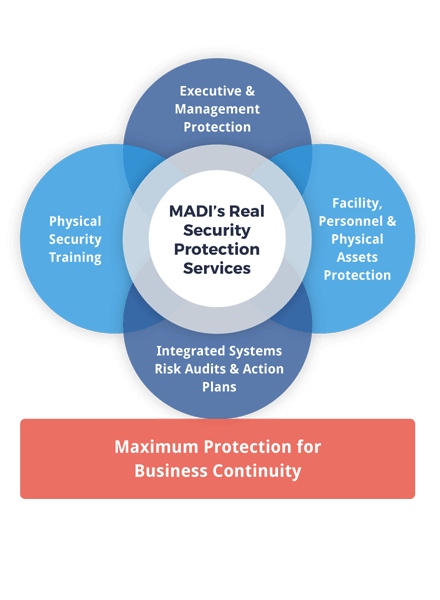 MADI’s Security Services will help you address physical vulnerabilities and prevent harm. Assess your current physical risk. We’ve spent 20 years protecting companies all across the U.S.
What differentiates MADI's Security Services? Talent. Proven talent, top-down -- from MADI’s Management and Executive team to our teams of Evidence Specialists and Security Officers recruited mainly from law enforcement and the military. MADI’s Leadership Team is made up of a former metro police detective and global corporate security director of F500 multi-national corporations, and military officers. Our team collectively has decades of experience training staff, heading security operations and providing protection in disruptive and hostile environments from natural disasters and civil disturbances to major sporting events, plant closures and labor disputes. MADI’s security teams of officers and agents are drawn from the ranks of former law enforcement officers, federal agents, military and senior tenured security officers. Each is selected specifically for his or her skills and ability to to interface with local agencies as well as their commitment to continuous training and flexibility to foresee and adapt to any harmful situation in compliance with applicable laws. They also possess proven ability to deliver protection under pressure and have a wide range of experience from fighting organized crime to providing physical security at major special events such as the Olympics and Wimbledon Tennis. MADI's strict zero tolerance to drug use, felonies, or other serious offenses help ensure quality and singular focus on protecting you and your business and contributing to business continuity. 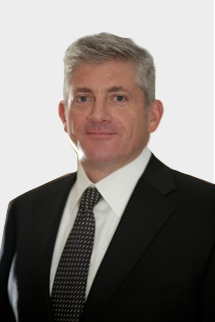 “MADICORP’s Security Services mission is simple: we're dedicated to protecting your people, property, products and brand at all times." Each MADI Security Officer is supported to think ahead in multiple dimensions under pressure, as well as to understand security from the perspective of protection -- planning all the way through to tactical implementation on the ground. All security personnel have extensive training on topics such as local, state and federal laws and regulations, and all state mandated training; latest security best practices; the NLRA (National Labor Relations Act) and current cases and decisions by the National Labor Relations Board; individual and team coaching for continuous improvement; and much more . Evidence Specialists are also specially trained in evidence collection and reporting in court admissible formats, as well as how to testify in court. Get an assessment of your company's ability to protect your people, assets and resources. What is your recruitment process? / What is your candidate ideal profile? All MADI security personnel undergo a stringent selection and on-boarding process, including multiple interviews with specially trained recruiters and MADI's management team who are specifically looking for candidates with proven character and commitment to the protection of our clients' people, property and products and brand at all times. Selected candidates then undergo robust background checks and drug screening. MADI's recruitment team then maps each individual's background and competencies with the clients' requirements and job specifications so you get the real protection you really need. What training does your team undergo? 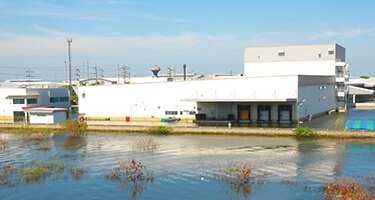 MADI's management team is committed to the principle of continuous improvement of all MADI protection personnel. Training is the central pillar to meeting this objective. MADI also has training programs that can be customized for your company's employees, managers and executives. Simply put, security are a series of measures from putting a uniform and badge on a person, to fencing and lights, that are put in place in order to attempt to control the environment and help prevent losses. Protection goes to the next level and takes into account the effectiveness of your security systems, as well as the quality, training and experience of your security teams. Do they understand the threats and vulnerabilities you face? Do they have the experience to respond in compliance with your company's protocols and local, state and federal laws? Do the systems you have in place take in to account physical risk management best practices and cost-efffectively maximize your investments? Is your personnel, property, products and brand protected at all times? 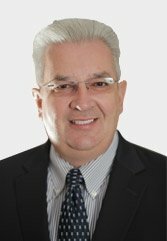 Is there a cost to a preliminary risk assessment? if the protection is in compliance with your company's tolerance for risk. 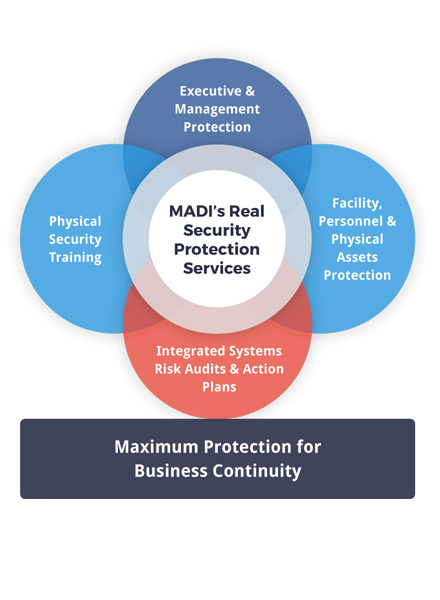 If a more complete assessment is needed, MADI offers a full suite of on-site business continuity assessment and planning services, as well as the deployment of highly trained and qualified protection teams if, when and where needed. How long does it take MADI to deploy? The high level answer is most often within 24 to 48 hours. There are a number of variables that can impact the speed of deployment, however. First is planning. Physical risk management best practice dictates pro-active planning. MADI is a strong proponent of Security/Protection Audits to aid in the reduction or elimination of physical threats and vulnerabilities at your facilities. An additional benefit of the Audit is the ability if gives you to select readiness levels for deployment based on your risk tolerance should a planned or unplanned event such as a natural disaster occur. The higher the readiness, the faster the deployment. MADI also has the ability to mobilize quickly without advance planning, but deployment can be subject to outside circumstances which may affect the speed of deployment process.